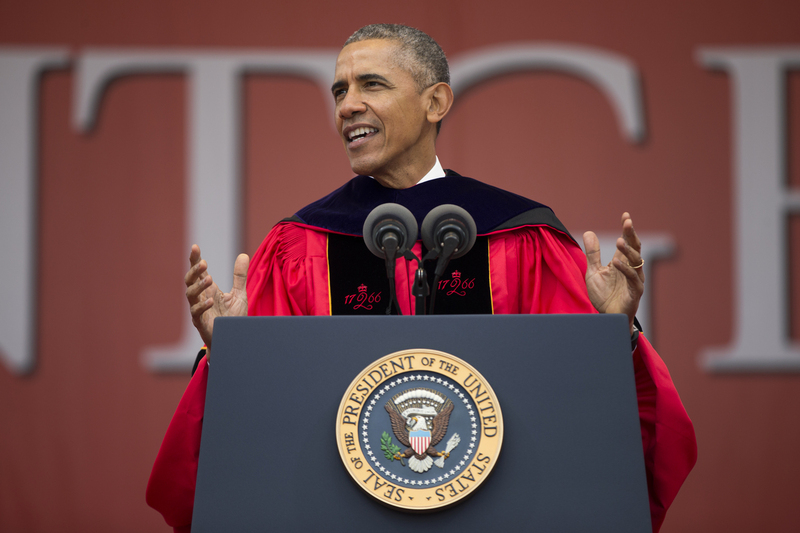 President Obama Takes Aim At Donald Trump Indirectly, In Rutgers University Commencement Speech : The Two-Way "Ignorance is not a virtue," the president told Rutgers University's class of 2016, in an apparent critique of Donald Trump. He called for embracing an interconnected world over building walls. President Obama speaks during Rutgers University's 250th anniversary commencement ceremony on Sunday in New Brunswick, N.J.
"Class of 2016, let me be as clear as I can be: In politics and in life, ignorance is not a virtue," President Obama told Rutgers University graduates in a commencement address urging broad engagement with the world. "Facts, evidence, reason, logic, an understanding of science: These are good things. These are qualities you want in people making policy. ... That might seem obvious. ... We traditionally have valued those things, but if you're listening to today's political debate, you might wonder where this strain of anti-intellectualism came from." Obama continued, "When our leaders express a disdain for facts, when they're not held accountable for repeating falsehoods and just making stuff up, when actual experts are dismissed as elitists, then we've got a problem." His full remarks — which you can watch here — "illustrate a world view antithetical to the ideas espoused by the presumptive Republican presidential nominee," as the AP reported. "The world is more interconnected than ever before, and it's becoming more connected every day. Building walls won't change that," Obama said, in an apparent reference to Trump's proposal to build a wall along the border with Mexico. He added: "The point is: To help ourselves, we've got to help others, not pull up the drawbridge and try to keep the world out." "That's not just a betrayal of who we are. It would alienate the very communities at home and abroad who are our most important partners in the fight against violent extremism." As NPR's Scott Horsley reported, Obama has delivered nearly two-dozen commencement speeches since he took office — and each has provided a snapshot of a moment in his presidency. Scott compared a 2009 speech at Arizona State University, where Obama spoke about the "historic recession," with his speech last weekend to Howard University grads, where he "said with confidence that this is one of the best moments in history to be alive." "You can track from the 2009 addresses a progression toward an Obama who believes that the economy is prospering and these young people are entering a much better world — implicitly, of course, thanks to his policies," Kathleen Hall Jamieson, who researches presidential speechmaking at the University of Pennsylvania, told Scott. "Twenty million more Americans now know the financial security of health insurance. We're less dependent on foreign oil. We've doubled the production of clean energy. We've cut the high school dropout rate. We've cut the deficit by two-thirds. Marriage equality is the law of the land." Obama still has one more commencement address scheduled during his presidency — he's set to address Air Force Academy graduates at their graduation ceremony next month.